Join the discussion on our forums! Come discuss Scargil over in our dedicated Scargil discussion topic. Wanna know how he got those scars? So does he. Why not play Unite the Murlocs in a deck like that? Finally. 1-mana Murloc Tastyfin becomes not that bad. You should be baiting out AoE before you play out your whole hand. Mike Wazowski, is that you? You look a bit different since we last met! Older British players will struggle to distinguish this card from Arthur Scargill, the trade union leader who led the miners strike. 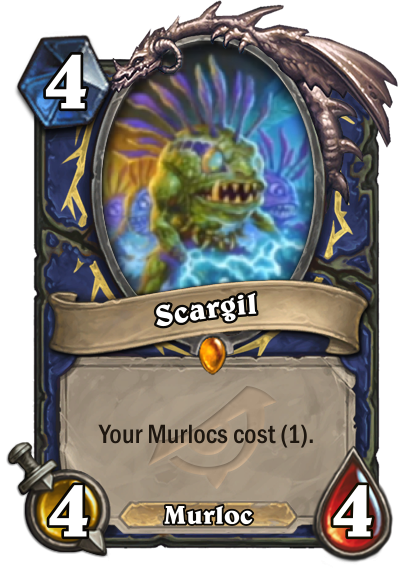 As for this card; I don't know if this'll make Murloc Shaman a thing again, but getting it from Neptulon's got to be good right? Let the murloc shenanigans ensue. The Murloc OTK in wild is coming, easier to execute than ever. Remember Ghost Light Angler. The one-card murloc legion is coming. Edit: Okay it's 2 cards. But thinking of turn 4 this into turn 5 10/10 stats is scary. Save removal for this one! For a Murloc deck, a single card eating their board clear is pretty good. Saves your other resources from being cleared as well.